Seminar: Should companies rely on their country of origin to differentiate from competition and attract customers? 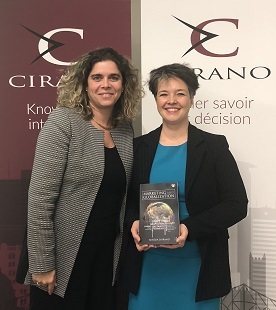 CIRANO organized a seminar for the launch of the book entitled Marketing and Globalization written by Aurélia Durand, Associate Professor at HEC Montreal and CIRANO Fellow on December 6, 2018. Four other CIRANO Fellows from HEC Montreal also contributed to this work: Ari Van Assche, Patrick Cohendet, EkaterianTurkina, and Thierry Warin. During this launch, Ms. Durand presented one of the chapters of her book on territorial and geographically based marketing. The presentation allowed for a better understanding of the concept of country of origin versus territorial marketing or place branding. Ms. Durand demonstrated this by presenting an analysis of several examples of companies relying on the geographic cues (Canada Goose, IKEA, Victorinox, and Volkswagen) as well as several national examples of place branding (Argentina, Australia, Chile, and Slovenia).